Once again and another chance for Next Sports Phenom to eyeball some of the up and coming talent from the DMV and surrounding area. The "Shot Doc" Keith Veney, Darren McLinton and Shamon Antrum (all former professional players) were the lead trainers for the day and ran the group of close to 50 kids from the class of 2022 (rising freshmen) to the youngest class of 2027 through entertaining sessions of drill and instructional work. The 4th She Got Game Middle School Combine is the younger sibling of the annual She Got Game Classic that has brought in hundreds of high school teams and college coaches to the DMV over the past 9 years. The combine allowed kids to not only showcase their skills, but to get better in a setting that they felt comfortable to learn in. 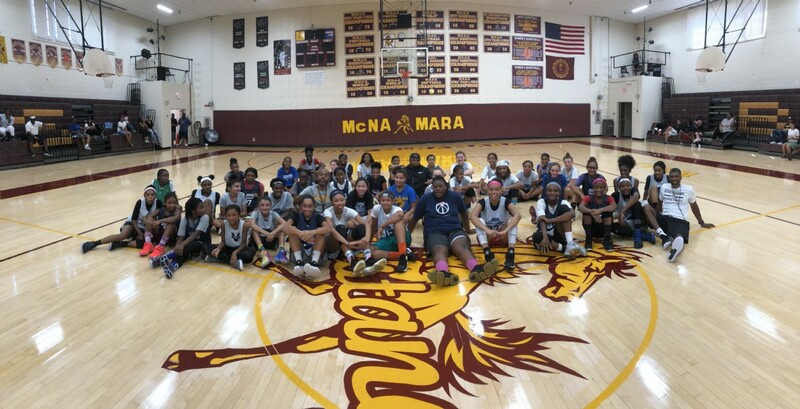 The event which took place at Bishop Mcnamara High School in Forestville, MD, there were many players that were able to stand out for various reasons and some players found it to be a big adjustment playing showcase style as opposed to on a set team. Many of the kids have been viewed before by Next Sports Phenom and I was able to see how much they have improved since the last time they were seen, however, there were quite a few newcomers that left their mark as well. At the end of the day each player had fun and got better. 695 Hoops, Serious Hoops and Premier Basketball Report (Texas) were all in the house along with Next Sports Phenom. NSP team would like to take this opportunity to mention a few players that stood out from the 2022 and 2023 classes. I really was impressed with Kennedy's growth from the first time that I saw her in a combine event to now. She was an effective scorer throughout without being selfish. She shot the ball well from deep and from the mid range and finished well inside, while also sharing the ball. 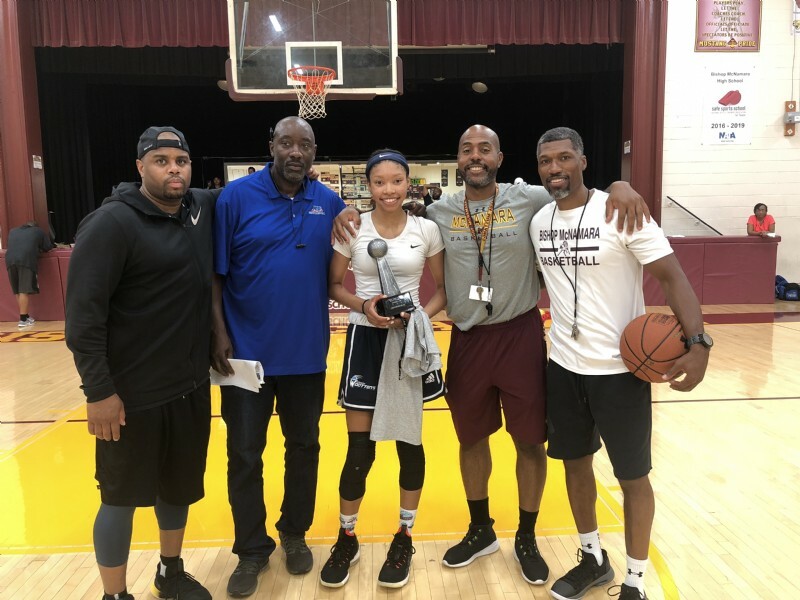 She looks poised to make an impact in her freshman year at Bishop Ireton under new head coach Kesha Walton who was on hand to view her prize recruit. Kennedy took home the combine's Most Outstanding Player Award for her play throughout. J'Khya showed good skill with her ball handling and shooting. Her all around play along with her positive attitude throughout gave her the MVP nod according to 695 Hoops who was in attendance. She will be suiting up for Archbishop Carroll this season and based on last season's results she should be able to make an immediate impact at multiple positions. Aaliyah finished well through traffic and showed the ability to hit shots from outside. She plays under control and uses her body well to absorb contact from defenders. Her frame is high school ready as she prepares for her season at Bishop O'Connell and the tough WCAC conference. Daneille played well scoring from outside and dishing off passes after driving. She has a tendency to jump while passing which can get a lot of players in trouble but, she remained accurate partly because she's able to see the play before jumping and knows where she wants to go with the ball. She is a playmaker that seemed to be involved in every play even if it was creating for others. She will play for Northwest High School this season. In a guard heavy combine, Olivia is a good rebounder in traffic and had her way in the paint. In these types of events it's rare that posts get fed the ball but, Olivia was unstoppable once she did get it. Fortunately, the combine had loads of skill work in the begining and she showed that she had some some agility and ball handling skill in her bag as well. Angela is one of my favorite players in the DMV and has one of the better handles that I've seen in a while from a player her age. She drives well changing directions in traffiic keeping her dribble until she reaches the basket where she finishes well. She will be at Sherwood High School this season and should see plenty of floor time as a freshman. Naila at 5'1" was able to get to the basket and finish easily over taller defenders. The Rockville High School freshman was able to be so effective because of her quicknes and the angles that she can finish from making her heigh a non factor in the lane. It was a good day for Alanna as she was very active throughout the day. She finished well using her body as a shield for the half hook over the shoulder. She gets good rebounding position and has a good feel of where the miss will end up. Calean finished very well at the basket. She was tough after contact and attacked to basket with aggression. with her speed if she narrows her driving lane a bit she will be very hard to stop from getting to the basket at will. Kristian showed she has a very good touch on her shot whether jumper or floater in the lane. She attacks the basket really well. She seems to be a team player but, has the size and ability to be an elite level scorer as she finds ways to create more opportunities for herself. Gabrielle has a nice basketball frame, she was probably the top defender in the combine. She attacks well, finishes well and makes good decisions with the ball. Joi was quiet in the beginnig of the combine but, really picked it up in the last hour or so. Maybe she had superior conditioning or maybe she was saving herself for later. If she brings her all every minute of every game she can make a major impact when she gets to high school. Anaiah's physical presence stood out, especially for a 7th grader looking like a high school junior. She was listed as a wing but, was most effective in the lane during the day. Nia had the best shot off the dribble that I saw in the building, this was impressive as many young kids have abandonded the pullup for low percentage floaters. Her mid range game opened anes up for her to drive to the basket where she finished great.